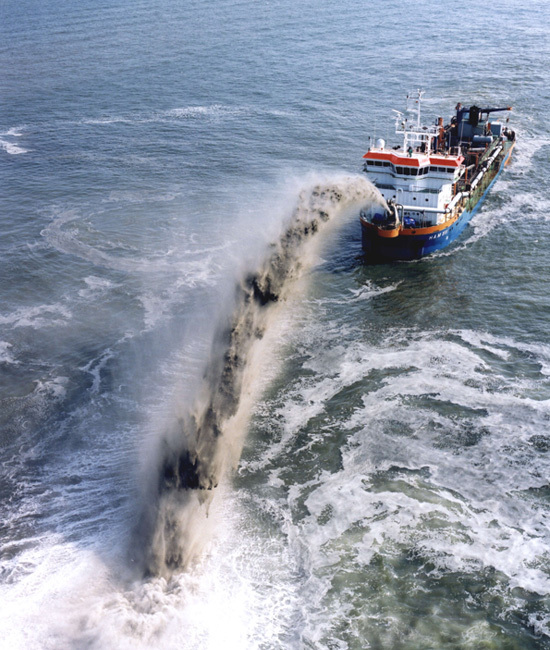 A trailing suction hopper dredger, or TSHD, is the sort of seafaring vessel you would want to buy if you plan to rehabilitate dying beaches, fortify riverbanks, recontour ports and harbors, construct offshore multi-terminal airports or send marauding bacterio-peninsulas to unsuspecting shorelines. It should surprise no one, then, that we want to comandeer about a dozen of them. If Michael Heizer had his bulldozers and James Turrell is having fun with his tunnel boring machines, we should be able to play around with our own earth-moving machines. 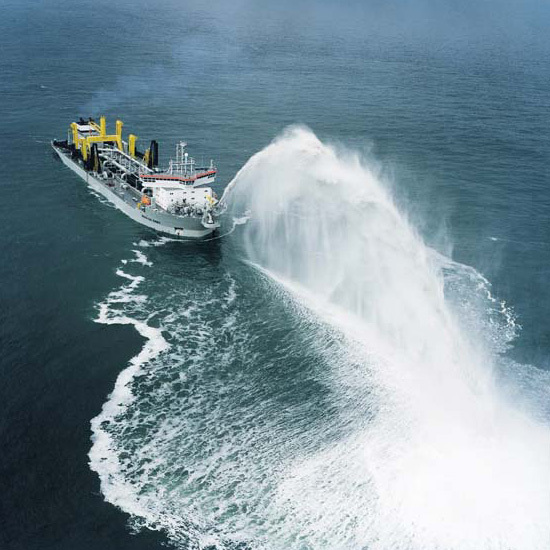 As but one of certainly many possibilities, we could use them to stage an utterly marvelous water show in the grand tradition of the naumachia, those monumental re-enactments in Ancient Rome of epic naval battles. Obviously, we would first need to reincarnate Busby Berkeley to help with the script, tentatively titled Adventures on the Continental Shelf. In semi-accordance with ancient practices, it will be performed entirely by a cast of quasi-slave workers from Singapore, Indonesia, the Philippines, Vietnam and Bangladesh. The Army Corps of Engineers will help with the art direction, and the Naval War College will provide the choreography. Months later the ridiculously wealthy and the grotesquely (in)famous will head off to Abu Dhabi (Dubai is so old news) for the world premier. With their 67-course Alinea dinner finished and the Veuve Clicquot now flowing freely, they will watch the armada glide across the moonlit Persian Gulf in interlacing figure eights and arabesque battle formations, arcing chunks of the mantle and patterning a frothy trail within sights of U.S. aircraft carriers and heavy battlecruisers guarding vital oil shipping lanes. A hydrological fantasie staged in a geopolitical minefield. Stone against metal against water. Their bones will tremble with the ambient vibrations. It's better than the Bellagio, they will say to themselves. Because any slight misalignment of the nozzle and their heads get sandblasted off from their torsos. During intermission, someone will go up to a group of totalitarian dictators awaiting their future micronations and ask, was Pruned inspired by the Battle of Leyte Gulf? The next day, hung over and with a mouthful of grit, they will step onto their manmade continent and set about showing those petulant Modernists and New Urbanists the proper way to build a thriving city without the ahistorical mimicry. Or maybe it's a game. 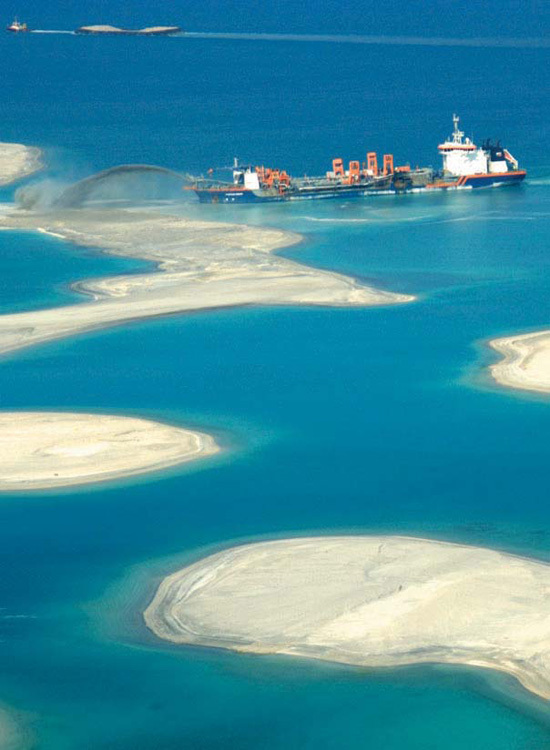 You are given a tiny speck of an island and there waiting for you is a set of groynes, sea walls, revetments, rip raps, gabions, breakers and a multi-billion dollar levee system. The challenge is in the assembly (perhaps Ikea would like to sign on as a sponsor), and whoever keeps their island above sea level the longest, wins. 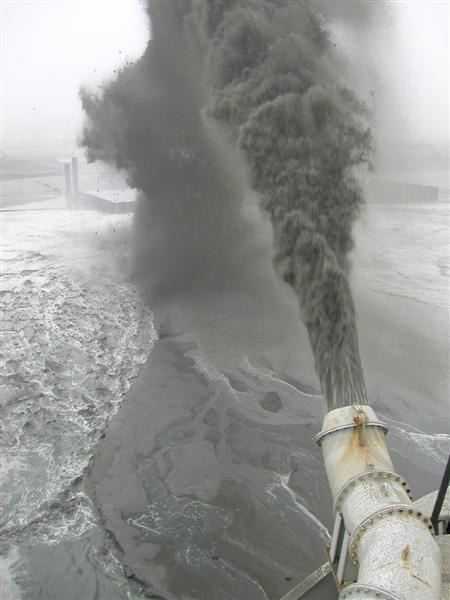 Meanwhile, in case you're wondering, a trailing suction hopper dredger operates very much like a floating vacuum cleaner. With a single or twin proboscis-like suction pipes, it pumps up materials from the sea floor and then discharges them into a storage compartment known as the hopper. You wouldn't find a land version of the TSHD cruising the arid expanses of the Arabian Peninsula sucking up desert sand, because apparently, unlike sand taken from the bottom of the ocean, desert sand isn't materially and structurally suitable for making artificial islands. 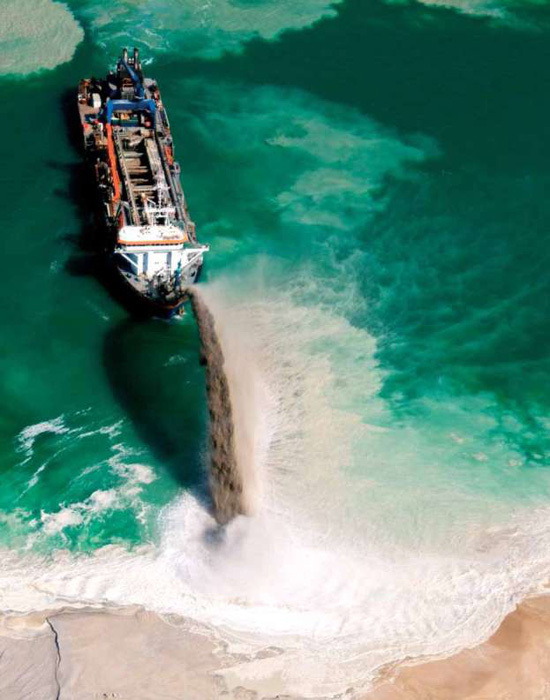 After filling up its hopper, the dredger would then sail to the disposal site where it unloads its cargo either by 1) opening the doors or valves in the hopper bottom; 2) using a pipeline running from the ship to the site; 3) or using a special bow jet. This last technique is known as rainbowing. 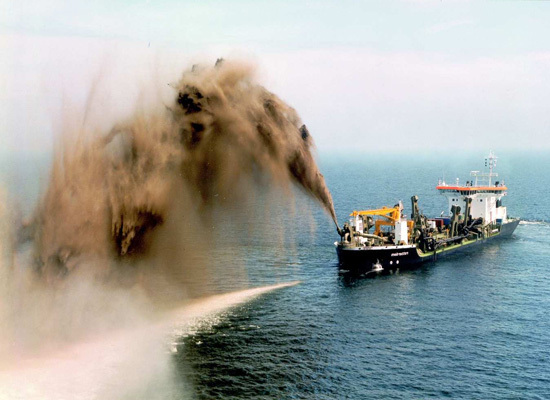 In case you're wondering as well, most of the dredgers shown in this post are owned by Van Oord, purportedly the largest dredging company in the world. The others are either owned by Boskalis, Jan de Nul or Dredging International. Would it surprise anyone to learn that these four companies are based in the Netherlands and Belgium, that these two countries — most of whose territories were reclaimed from the seas — have a near monopoly in TSHDs? Standing beneath a roaring froth of regurgitated geology. Loveliness. Beautiful images although I point out a small edit: Singapore is a country that EMPLOYS foreign laborers, not exports them. There are barely enough Singaporeans to do service jobs here, let alone sending them abroad to be maids and manual laborers. 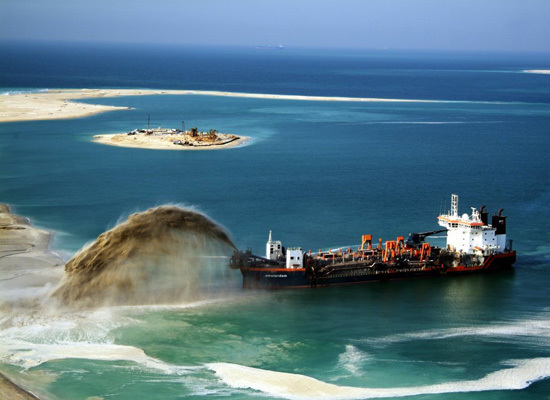 Singapore has increased its land area dramatically using dredging technology. I've seen some of these spray dredging machines in action, and although the sea wasn't nearly clear emerald green like your photos, seeing a ten-storey high slurry plume being blasted across the air is quite stunning in person. we made the 8 th wonder of the world and no one notices. I like the description of the fantastic scene, the protagonist chilling with some tycoons, cold bosses just balling so hard.